Rising input prices coupled with poor access to capital and markets are pushing weavers into other professions. "We do not wake up to the sounds of the looms any more," laments Eluri Lakshmi. The 35-year-old is waiting with her two daughters for her husband Eluri Srinivas to show BT the working of their pit loom. And in the process, break the eerie silence of the Padmashali colony in Ramannapet mandal of Nalgonda district in Andhra Pradesh, an important handloom cluster where weavers produce the famous Pochampally sarees that are woven using the ikat technique. Ikat involves dyeing on either the warp or weft fibres and then weaving the exquisite cotton or silk threads into sarees with geometric designs. "Most are seeking other sources of livelihood," says the 48-year-old, who has given up the skill he practised for over 35 years. Four months ago, Lakshminarayana joined a local security service agency to work as a guard. "Making both ends meet was getting increasingly difficult with the rising input prices. A spike in food prices also added to household expenses. It was just getting unsustainable." Cotton yarn prices have almost doubled in the past one year, he says. Silk, the other crucial input for Pochampally sarees, nearly doubled in the last five years to over Rs 3,000 a kilo. Just 18 months ago, it was hovering around Rs 2,100. The pain point: all of this is without a proportionate rise in the product price or the wages. For instance, the price of a ordinary silk saree today varies between Rs 2,500 and Rs 3,500; it was not very different a few years ago. The daily wage for the weaver has remained stagnant, and in Andhra Pradesh, it varies from Rs 60 to Rs 450 per day depending on the skill and output. The average, most feel, would be around Rs 100 - a sum any worker can earn from a 10-to-5 job under the Mahatma Gandhi National Rural Employment Guarantee Scheme. "On an average, there has been a 30 per cent fall in handloom production in Andhra Pradesh, and between 30 and 50 per cent nationally because of the high yarn rates," says Donthi Narasimha Reddy, who has tracked developments in the Indian handloom sector for around 15 years. Reddy advises Chetana Society, a non-government organisation involved in creating awareness and capacity building for weavers in regions like Nalgonda. "Of the total 3 lakh handloom households in the state, there are 15,000 in the Pochampally cluster, and the production volumes fell to 15.5 million metres (pegged at Rs 542.5 crore) in 2010 from the previous year's 22.1 million metres (worth Rs 607.75 crore)." As for the state, he says, the 3 lakh handlooms produced 309.3 million metres (pegged at Rs 10,825 crore) in 2010 as against 441.9 million metres (worth Rs 12,152 crore) in 2009. 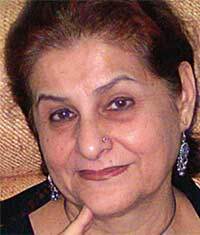 Nationally, the industry has a turnover of around Rs 60,000 crore. En route to Koyyalagudem, a village in the neighbouring Choutuppal mandal, we meet Kasturi Chandrasekhar. 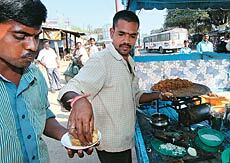 The 30-year-old does a a brisk business dishing out cutlets for Rs 7 a plate and panipuri for Rs 5 a plate from his roadside pushcart. "I have paid back the Rs 10,000 loan I had taken to buy the pushcart. 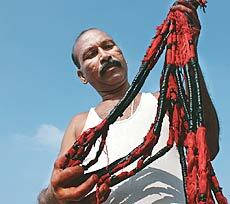 I am earning Rs 5,000 a month as against Rs 3,500 I earned as a weaver," he says. It is not without reason that the National Council for Applied Economic Research, or NCAER, an economic think tank, points to some worrying trends in its just-released 2010 Handloom Census. "The average handloom worker earns a little more than those on the poverty line. The average nationally is around Rs 36,096 per annum; it is Rs 28,305 in Andhra Pradesh," says Rajesh Shukla, director, NCAER-Centre for Macro Consumer Research, or CMCR, and the team leader of the census report which was released in December 2010. Though the census has not combed all regions and a second round of survey is being planned, Shukla says the total number of weaver households in the country is down to 22.7 lakh in 2010 from 25.3 lakh in 2005. Plus, it points to a clear threat perception from the powerloom sector. "Only 25.3 per cent of the households were positive about their children continuing in the trade," he says. "If the current trend continues, there will be no significant craft left in the next five to seven years," says William Bissell, Managing Director of Fabindia, which does a thriving business in traditional crafts by joining hands with artisan groups. Bissell advocates at least three times the minimum wage for the weavers but is not for subsidies, saying that it will kill the industry. Instead, he favours laws to ensure protection of India's intellectual property. In a sector where cooperatives have largely failed, Fabindia has built a model where products come from over 21 states. The company's supply chain is arranged around 16 community-owned companies, or COCs, facilitated by the unique micro-credit mechanism or Artisans Micro Finance, a wholly owned subsidiary. These COCs act as aggregation points, and are structured in a manner that enables active participation of artisans and craftsmen as suppliers and shareholders. Jane E. Lynch, a doctoral candidate from the University of Michigan, who is researching the sector and has been to Kutch, Ahmedabad, Kolkata, Hyderabad, Jodhpur, Jaipur, Sanganeer, Maheshwar, Indore and Delhi, feels there can be a way out with community-owned entities (like Fabindia), and through investments in training like those offered by Kala Raksha Vidyalaya, an NGO in Kutch. "The NGO provides training to young artisans to develop their skills. The training also includes introducing them to the kinds of urban markets and consumer demands for them to be successful in the broader market and be less reliant on intermediaries." Companies like Fabindia and Anokhi, operating with different business models, she says, have been successful in connecting handlooms and other craft products to consumer markets. Other initiatives like Dilli Haat, which provides a vibrant retail forum not only for weavers but also for other craftsmen, seem to be thriving. Even government officials agree. "Apart from better marketing avenues and good designs, access to working capital is a major problem. Every weaver typically needs about Rs 25,000 working capital to start with and since they have no land assets, banks are not willing to support them," says I. S. Naresh, Director of Handlooms and Textiles, Andhra Pradesh. To tide over such problems, the department proposed a Rs 1-lakh loan at 4 per cent interest (Pavala Vaddi scheme), but the scheme is still pending. It will cover 250,000 families over a five-year period. While the working capital may take some time, the weavers from Andhra Pradesh have found a reason to celebrate. Sixty-one-year-old Gajam Govardhan, who has experimented with ikat dyeing and weaving, was awarded a Padma Shri. "The era of cooperatives is over and we need to replace it with a direct procurement system. The government could create access by innovative policies, such as the tax breaks given to IT companies, for promoting handloom products,"says Govardhan, a master weaver with close to 1,000 weavers working for him. Not only has he built own customer base, but he also exports directly. Now that is called spinning a success story. Since 2004, the handloom sector has been assigned to me as a Member of the Planning Commission. In most of the clusters I visited, there was deprivation and exploitation. I looked at their skilled hands which were pounding stones or digging earth. Children were not learning skills of their parents. Instead, they were pulling rickshaws, picking rags, building roads... doing anything but weaving. I rued that these youth would never see a himroo weave, a kaani shawl or know the kamkhwab fabric which was woven for the Mughal royalty. India's post-Independence USP is getting lost. Without a massive effort it will be the end for most weaves - jamdani, Kanjeevaram, tangail, kota doria, tanchoi, Bhagalpuri, ikat, gadwal, paithani... I could go on. Next to agriculture, handlooms (and handicrafts) create the highest employment in the country, but the per capita income of these workers is no more than Rs 50 a day. The government schemes are of two kinds: either pertaining to welfare such as life insurance or health insurance, or creating clusters for access to common facilities. Tagged on to these are schemes of financing, buyer-seller meets, subsidies and upgrade of work spaces. Out-of-the-box thinking could push this sector on the global map. Schemes we have been pushing for years will just not work. Had they worked, there would have been visible improvement. The Weavers' Service Centres have not worked. Designing needs to be much more savvy and aggressive. The other part of our effort should be to shore up the supply side by making credit freely available, getting designers and entrepreneurs, and giving a free rein to creativity. Handloom budget is a very small percentage of the whole, agreed. But is pumping more money into non-viable schemes the solution? Or should we restructure the entire system? The neoliberal philosophy is to let the "sick" sectors fade away. But can we afford to? Think Indian fabrics, and the Banarasi saris, Kanjeevaram silks, apparel and home decor fabrics woven by handloom weavers come to mind. 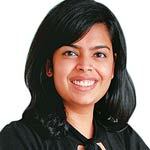 Yet, despite willing consumers, the Indian handloom sector faces a paradox. 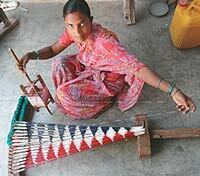 The producers of these exquisite products, the skilled handloom weavers, are today seeking to leave the profession. Even with the emergence of retail outlets to showcase their work, not all these artists get a "fair" percentage of the final price paid by the consumer. This situation is due to the inability of these craftsmen to market and distribute their products effectively. While some retailers have figured out how to work with these craftsmen, most face several hurdles, including lack of production schedule, consistency across products, small batch sizes and defects. What is needed is a comprehensive effort where an ecosystem is created to help craftsmen deliver what buyers need, and monitor buyers to ensure that they do not exploit these craftsmen. Pepsi faced a similar problem when it entered India and tried to source potatoes and tomatoes. What it found were crops which varied in size, colour, taste and texture. It cracked the problem with contract farming. This approach can be extended to cover handloom products. If a private or government organisation works with these craftsmen, develops standards for production, sets a production schedule and guarantees purchase of output at a fair price, this unique Indian art may just avoid extinction.